A bedbug does not actually live under your skin, but will simply drink a few drops of blood while you are sleeping. You cannot feel its bite, even though it is actually piercing the skin. Although some saliva will get into the bite, bed bugs are not known to pass on any diseases to humans. 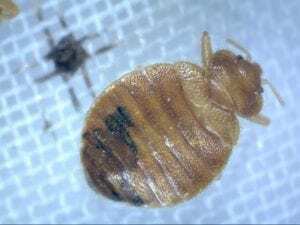 The different species of bed bugs have different feeding preferences. Some prefer human blood while others prefer bats and birds. Bedbugs primarily reside in their target’s nests or nesting areas. While many bed bugs hide in mattresses, some may also hide in a sofa or chair, or behind wall paper or pictures. Thoroughness is the only real way to get rid of Bedbugs. Every corner and crevice needs to be searched. As you might guess, this means that simply getting rid of an infected mattress will not completely solve the problem.